There has been a slow progress in climate discussions over the years with global leaders now realizing it's no fluke after all but, they never needed to wait this long to know that what the activists and scientists were calling their attention to was indeed real. While in high school, I could only associate the word "refugees" with war but today, the word is more dominant with climate change and quite disappointingly, the next generation may only know refugees to be victims of climate change. As a kid, I watched water sink into the earth when it rained but today, the water runs atop the earth as flood even after it has stopped raining. It is also not surprising that the flood of Syrian refugees into Europe has spurred European leaders to call for an "ambitious, robust and binding global climate deal". This was the mood set by European Commission President Jean-Claude Juncker who frankly observed that "climate refugees will become a new challenge - if we do not act swiftly." He made these comments during Junker's first annual State of the Union speech to the European Commission in which he pointed out that climate change is "one of the root causes" of the ongoing refugee crisis out of Syria. The drought in Syria a few years ago reportedly displaced about 2 million people which contributed to the current crisis and that number is part those now knocking on the doors of the EU as refugees. A senior British political leader, Lord Ashdown, succinctly captured the situation thus "the Syrian crisis is simply a dress rehearsal for an immense climate-fuelled disaster, which I think will begin to be felt within the next decade, perhaps within five or six years from now." Indeed, Nigeria had an ugly experience of what climate change could do in 2012 when an unprecedented flood disaster happened affecting about 30 of her 36 states. 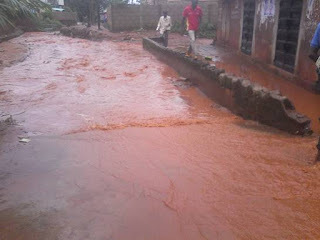 In 2013, the director general of the National Emergency Management Agency(NEMA), Alhaji Sani Sidi, said of the 2012 flood, "We recall what happened last year, the unprecedented flood which led to the displacement of 2.1 million people across the country and it affected over seven million people. It led to the death of over 363 persons". The hardship the displaced citizens passed through is better imagined than experienced. Of course the flood owed much to the release of excess water from the Ladgo dam in Cameroon without the prior knowledge of the Nigerian authorities but the accumulation of excess water in the dam was just a clear indication of how swift climate change impact could be. Now, as of August 2015, three of Nigeria's 19 northern states have seen 86, 710 hectares of land valued at N1.58 billion destroyed and a total of 20, 477 homes also affected while about 50, 000 people have been rendered homeless as well as 11 deaths recorded all because of flooding owing to just heavy rains and this figures are expected to increase massively across the country in a few weeks. We simply cannot continue like this! We can't keep walking the path of defeat and shame of our inactions as it's time to simply get off the beaten track. As we prepare for the talks and binding agreement in Paris this December the Nigerian government must look into immediate/short term solutions for this scourge as we can't simply watch citizens being displaced and killed year after year by floods and other climate change consequences and only offer a well-intended but meaningless pity. Nigeria has to embark on massive afforestation as its deforestation rate is clearly the highest in the world. The new President, Mr. Muhammadu Buhari, has ordered the encouragement of the use of Liquefied Natural Gas(LNG) by most Nigerians for domestic purposes to reduce the rate at which trees are cut in search of firewood. Mr. Buhari has also ordered the federal ministry of Environment to look into the 1920 Lake Chad report which proposed ways of saving the lake- which has shrank from 33,000square kilometers to 300square kilometers in the last two decades- from drying up. This Lake provides water to about 68 million people from communities in Nigeria, Chad, Cameroon and Niger living around the area and economic activities has since been grounded. There's also the idea of introducing Clean Cookstoves to help reduce emissions, which is still starched in controversy, and these, in addition to the Great Green Wall project which the ex-President started to stop desert encroachment in most states especially in northern Nigeria are all laudable projects that will have an immense positive impact on the environment butbeyond that, we have to enact new laws and enforce existing ones that will help us protect our environment. We have to make laws that will make it the mandatory duty of all government ministries, departments and agencies as well as private firms to be concerned about the state of their respective environment. It has to be in form of a mandatory Corporate Social Responsibility. US, EU and China say or agree to at the COP 21 in Paris is where Africa must pay attention as it will directly affect the continent. So, it will be wise if we carefully study the situation in the aforementioned places and draw up a proposal of the way which those countries should go that will favour Africa as the climate crisis really is a global challenge and must be solved collectively. It was good to know that Junker wanted it to "be very clear to our international partners" that the EU "will not sign just any deal" at the UN climate talks in December. This he concluded would include a strong global emissions reduction target of at least 60% by 2050. It shows that the world and more pointedly, the big emitters, have been woken up to their responsibilities by the Syrian refugee crisis. However, analysts believe that unless the UN climate talks agree to make sharper short term goals, we may risk soaring over the 2 degree mark and that's what Africa has to do at the COP 21, to push the big emitting nations to agree to great short term goals and also ensure their implementation. The negotiations in Paris will be more crucial than any in the history of the COP and African leaders must be alert, aware and resolute in their stand for a short term solution to climate change as that will make the nations more committed in achieving the targets. But just as it is for Africa, the EU should indeed, do all within its powers to come to the COP with an implementable and effective short term plan that will have an immediate impact on climate. It is important to state here that if EU refuses to act strongly, they should be ready to welcome overwhelming number of climate refugees from Africa in a few years. Not even the walls of Hungary or the police barricades of Croatia will stop the army of climate refugees that will swim to the gates of EU and US. As Lord Ashdown recognized, "Once the crisis is upon you, it's too late to start working out your priorities". At the Conference of Parties in Paris, we have a chance to make history and secure the future for the next generation or forever remain villains for ending the possibility of the continued existence of humans in this planet. Climate Justice Ambassador, Climate Tracker and a young Radio Host.